This is a Paleo sun-dried tomato chicken thighs recipe. The chicken is tender and falls off the bones and the tomatoes add so much flavor. This recipe is Paleo, gluten-free, dairy-free and is good for a Clean Eating diet. It only takes 15 minutes to get started and then most of the cooking is done by your oven while you clean your kitchen, work, play or relax! I end up making this recipe a lot because I love that I can get so much done while dinner is cooking. The other day I listened to my daughter read her book, started a load of laundry, watered my plants and cleaned my kitchen. Plus, I love how it smells fantastic and tastes so good! This is one of my personal favorite chicken recipes of all time. It’s just a bonus that it happens to be healthy too! 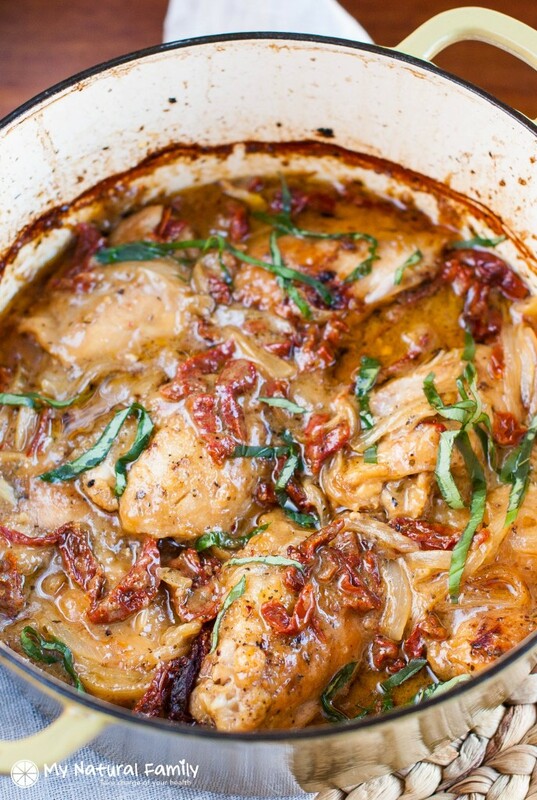 The sun-dried tomatoes add a lot of flavors and the chicken turns out so juicy and tender. It is a versatile dish that can be made for gathering or just for one or a couple of people. It’s actually pretty impressive for company. If you haven’t ever had sun-dried tomatoes, it’s hard to explain the flavor, but they are really concentrated and really do taste like the sun. You can actually dry them yourself by putting tomatoes in the sun for a few days until all the moisture is gone from them. They taste a lot better that way than if you just put them in the dehydrator. It’s similar to dried apples. If you’ve ever had apples dried in the sun, then you will never like dried apples that haven’t dried in the sun. Everyone I serve this for loves it. And if you haven’t tried coconut milk in a savory recipe, give it a try. I put it off for a long time thinking it would taste sweet and coconut-y and it doesn’t. Well, maybe a tiny bit. But the only time I can tell is when there isn’t much flavor in the dish. But this recipe has plenty of strong flavors to balance it out. Plus, it’s really versatile. The sun-dried tomatoes are so good, but not totally necessary. You can just leave them out or use something else with a umami flavor, like mushrooms or maybe peppers. This is really good with some real Parmesan cheese sprinkled on top. You can use chicken breasts, chicken tenders or chicken thighs without the bones. Reduce the cooking time a bit so you don’t overcook the chicken. I generally use the chicken thighs with bones because I think they have the most flavor, but sometimes when I’m in a hurry I use chicken tenders and it turns out fine. You don’t have to coat the chicken with the flour, although it does help thicken the sauce and give it flavor from the browning. But you could use chicken thighs with the bones and skins instead. If you aren’t on a dairy-free diet, you can substitute heavy cream for the coconut milk. If you want to use canned sun-dried tomatoes, make sure to drain them and blot them with paper towels. If you don’t have one pan that you can use on both the stove and oven, just use a skillet on the stove top and move it to a 9×13 pan with tin foil over the top. It’s good served with something to soak up the sauce, like quinoa, cauliflower rice, Clean Eating noodles or brown rice. Unfortunately, this recipe doesn’t convert well to a slow cooker. You just don’t get that deep roasted flavor. Maybe you could try starting it in the slow cooker and then finishing it off in the oven. I would love for someone to try and let me know if you know a secret to make it work though. There are also quite a few things you can add and you can read through the comments to see what others have done. I would love to know if anyone has figured out a way to get this recipe to work in the slow cooker and/or Instant Pot and have it turn out anywhere close to the original recipe. If you have, please comment below and tell us your secret! This recipe uses canned coconut milk, but any type of milk will do, including cream, if you eat that sort of thing. BTW, what is your favorite Paleo baked chicken thighs recipe? This chicken was amazing. The clean eating/dairy free aspect doesn’t change the quality or taste whatsoever. So good. There is about 15-20 minutes of prep work, but after that, it cooks in the oven and is fall off the bone tender. Recipe calculated using 1 chicken thigh per person. On average, 8 chicken thighs with bones will weight about 3 pounds, much of which is bone. I calculated this recipe for 8 servings. So if you eat a different amount, say 2 chicken thighs, then double the nutrition facts. * If you can only find sun-dried tomatoes in oil, just do your best to pat off the oil with paper towels before adding or leave the equivalent amount of olive oil from the recipe. I never review recipes, but I just have to this time. This is the most delicious chicken I have ever made, and I cook pretty much every single day. I think cooking in a dutch oven totally makes it, but the flavor profile, too, is unbelievably good. My husband ate it and proclaimed it to be cozy comforting restaurant type chicken. All this without any heavy cream!!! amazing. thank you so much! Thanks for your review. You make me want to me it again! This looks awesome! Any suggestions on how to make this with both chicken breasts and thighs? My husband only likes white meat but I love the flavor of meat on bone. Maybe your suggestions could help me with other thigh recipes as well. Thighs take longer to cook than breasts, so cut the thighs into smaller pieces so they cook faster and you don’t overcook the breasts. Could you use arrow root starch instead? I haven’t tried it myself but two other commenters did and said it turned out fine. So good to hear. I’m glad you like it! This is one of the best chicken recipes I’ve ever had! I will be making this very often. It was delicious! I’m so glad you like it. Thanks for commenting! I added green beans and it was great! Good to know. Thanks for commenting! This recipe looks delicious. I’d like to make it. How do you serve it? It is to be served over rice or what do you serve along with it for vegetables? I’ve served it with all sorts of things. Most often I serve it with mashed cauliflower, but if you read through the comments there are tons of ideas of things people have done to modify the recipe, things people have added to it and what people have eaten with it. We LOVED this recipe! I also served it with mashed cauliflower. The sauce in this recipe makes a great “gravy”. I can’t believe how incredibly delicious this dish is!!! I made it twice this week! My family loves it 🙂 thank you. I’m so glad you like! It’s especially good when you can find something your whole family likes – glad I could help. This was very good and I thank you for sharing. This is Day 11 of my first Whole 30 journey. I made this tonight and I have a lot of sauce left. Do you have any suggestions on how I can incorporate the sauce in other dishes for the week? Thanks!! There are lots of ideas if you read through the comments, but I like to use it for a gravy on mashed cauliflower or on almost any veggies to give them a little extra flavor. Wow this was amazing! I used chicken breast and over cooked them a little but the sauce made up for it! I added red and yellow peppers, omitted chili flakes (my son won’t eat spicy food) and served it over couscous. My in laws are Chinese and my FIL is very picky, and even he liked it! I’m so glad everyone liked it! Thanks for commenting. This was (expletive) delicious! I did have a few audibles. Like another reviewer, I added magic mushroom powder to the tapioca flower dredge. I added a few drops of fish sauce to the coconut/broth because ALL THE UMAMI! I used boneless skinless thighs and did 400 degrees for 25 mins. Cooked ‘tatoes in the IP and mashed ‘em up in the ‘ol kitchenaid mixer with homemade bone broth and KerryGold. I wanted ninths but seconds was all I could handle. Can’t wait to eat it tomorrow for lunch. Husband was super happy about it too! I’m so glad you liked it! It’s definitely a keep. This was fabulous. I used light coconut milk, added mushrooms and served with mashed potatoes. One thigh was plenty. Thanks for the comment and ideas for substitutions! Made this today for meal prep for the week. Just like everyone one else said it is delicious and will be on repeat. Used boneless skinless chicken thighs at 400 for 30 min. Added mushrooms and poured over cauliflower rice. Next time will do over spaghetti squash. Sounds wonderful! I always have to do the mushrooms at the last minute in a little pan just for me cause no one else in my family will eat them. They don’t know what they are missing! The recipe calls for sun dried tomatoes not packed in oil but the video clearly shows sun dried tomatoes coming out of a bowl with oil all over them, I’m confused. Well. . . that’s all I could find on that shopping trip. And the recipe came out fine. I keep meaning to add to the notes that you can only find sun-dried tomatoes in oil, just do your best to pat off the oil with paper towels before adding or leave the equivalent amount of olive oil from the recipe. So thanks for reminding me. . .
Maybe? I haven’t tried it myself but maybe some of the readers have? This recipe is absolutely delicious! 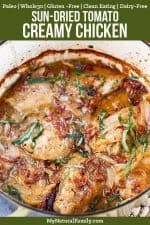 Help I cannot find the recipe for creamy chicken with sundried tomatoes. I made it a week ago- but now I can’t find it!! It is delicious!! Try again. I accidentally deleted all the recipes on my blog when I was trying to figure out another problem. They are all back up now. I wish I could afford that beautiful cooking vessel you use. Not at this time, lol, but maybe in the future. I do have a ceramic baking dish with lid thats roughly the same shape and dimensions… What do you think? I will also being using chicken tenderloins as that is what I have on hand. Had to go paleo because of my health and I am really grateful for people like you that take the time to share these recipes. If you are ever by a Le Creuset Outlet store, try there. I bought mine for 50% off on a big after Christmas sale. A ceramic baking dish should work fine for the oven. Just start it on the stove in a frying and transfer it to the baking dish. I hope you like it! Actually, someone just commented about this right above you, but I hadn’t approved it yet. They said it worked but it didn’t have the good roasted flavor from the oven, so that’s something to consider. Hi, what about a croc pot? You can try doing it in the slower cooker, but it honestly won’t taste the same. You won’t get that oven roasted flavor and it will be runny, but maybe you could try starting it in the slow cooker and then finishing it off in the oven? I made this tonight, used the instant pot… It had lots of flavour and was super tasty but I think better baked slow to really let the flavor simmer 🙂 Served with linguine noodles. Good to know that you can cook it in the Instant Pot, but that’s what I suspected. Some things you just need to bake to really get the good baked flavor. I recently downloaded a new cookbook app and have been having great fun scouring the internet for recipes to add. Some tried and true, some brand new. We’re are typically Paleo but recently started a Whole30 so that’s been the focus of my searching. Tonight, I tried this for the first time while my husband is out of town. I’ll tell you what, I am GLAD he is not here to eat any of this! All mine! I cannot wait for leftovers at lunch tomorrow. So creamy, so flavorful. I followed the recipe as is and couldn’t think of how it could be any better until I read some of the other comments. I will definitely try adding some green pepper and mushrooms and I’ll also use my Instant Pot – who wants to wait an hour for a taste this great! So after licking my plate (I’m not kidding, I did), I came back to the internet to search for this recipe so I could leave a comment. Funny thing – it turns out this is the 2nd of your recipes I’ve tried recently. I tried your Paleo pizza crust about 2 weeks or so ago and loved it so much we had pizza twice that week. I’m not really good about leaving reviews but that pizza crust was phenomenal and I left a review for that one as well. I’m going to have to take a closer look at the recipes on this site! This will be a great way to impress company. ESPECIALLY those who hear about my Paleo diet and wonder “What CAN you eat?? ?” Yeah, I eat this. All day. Boom. Your comment made me so happy. I’m so glad you’ve found some recipes you like. This recipe – https://www.mynaturalfamily.com/recipes/paleo-recipes/paleo-cashew-chicken-recipe/ has gotten a lot of positive reviews lately, so maybe it could be your next recipe to try! Can I use almond flour instead of the tapioca? And if I uses cas iron skillet without a cover is that okay? You can try. The tapioca flour thickens it though and the almond flour wouldn’t do that. Instead, it would make it a bit grainy. I like chicken breaded with almond flour, but more in a recipe like this – https://www.mynaturalfamily.com/recipes/clean-eating-recipes/quick-simple-pan-fried-gluten-free-lemon-chicken/. I wouldn’t recommend a cast iron skillet cause you aren’t supposed to put tomato in cast iron. This recipe looks delicious and I’m excited to try it. I’m following a strict ketogenic diet and don’t think that I can use cornstarch, potato starch, tapioca, or arrowroot due to the carbs. I am assuming that they are added to thicken the sauce. Do you know if xanthum gum would work in this recipe? If so, any idea how much? If it were me, I wouldn’t bother with thickening it. I often don’t thicken it cause I’m lazy and I think it’s just fine. I made this a few days ago. OH. MY. WORD. It was “lick the plate” delicious! We took one commenters suggestion and used our instant pot, plus a few other adjustments, but still keeping it W30. My husband jokes that I use recipes as a guide! He’s not wrong! haha. I added some of nom nom paleo’s magic mushroom powder to the tapioca flour that I coated the chicken with as well as various other spices. You know, a little of this and a little of that? Then we used more onions than suggested and some fire roasted peppers we had on hand. Once the whole thing was done I put the chicken thighs on a baking sheet, lined with parchment and placed them under the broiler for a few minutes to crisp them a bit. While that was happening I thickened the sauce with more tapoica flour, mixed with cold broth to get the lumps out (NOBODY want’s lumpy gravy!). Served it all over a big, delicious pile of mashed potatoes. We will DEFINITELY be making this one again! Sounds delish and I love all the suggestions of ways to modify – and I’m sure other people appreciate them too. Thanks for commenting! Absolutely incredible! This is my favorite paleo recipe that I’ve ever cooked. I took it to friends who had just had a baby and they loved it too. I even have my mom hooked. Feels like comfort food which is exactly what I want this time of year. Yes, it’s the perfect comfort food and I love it when people who aren’t even on the Paleo diet eat it. Thanks for commenting! Just dropping by to say that I LOVE this dish! It’s one of my go-to recipes when I am doing a round of Whole 30. I made it this week and decided to double the sauce so I could serve it over zoodles, like a pasta dish. I basically doubled everything on the ingredients list from garlic down (except basil). It turned out a little runny and I had to reduce the sauce on the stove after baking, so maybe I’ll use less broth next time. Anyway…it was amazing!!! Thank you for the recipe! What a great idea! I’m so glad you like it and I love the tip and I’m sure it will help other people too. My goodness this was good!! I made my own dried tomatoes (cherry tomatoes cut in half roasted cut side up at 250 for 2 1/2-3 hours), and chicken breast because I was too hungry to wait for thighs to thaw out ? I will definitely be making this again–many times! What a good idea to make your own dried tomatoes. They are so expensive in the store and sometimes hard to find and I bet they taste really good homemade. Thanks for the tip! Fantastic just as is! Thank you very much for posting! Whole family loved it! I’m so glad you like it. Thanks for taking the time to comment! Hi, I cannot figure out how to email you. I am trying the creamy sun dried tomato chicken thigh recipe and have a few questions . It is probably on here, but I cannot find how many servings is in this recipe. I am trying to get an accurate idea of the calories per serving. my package of 6 thighs weighed in a 2.5 lbs! Can you help with this? To email me, you can just comment on any post and I’ll get an email. The servings are on the recipe in one of the orange boxes. I calculated it based on 1 serving per each chicken thigh. Cornstarch isn’t Paleo, but probably has a similar amount of carbs, as far as the nutrition label goes. Is that what you are asking? Do you know why cornstarch is not Paleo? Also, are your boys and husband happy with 1 thigh? Cornstarch has corn, which is not Paleo. The serving size of one thigh is a standard serving size. Many people eat more than one serving, but having the serving as one thigh makes it easy to calculate if someone eats more than one serving. Loved this! Simple to make, and my whole family loved it. They were surprised to find out it was Paleo too! No left overs for us (family of 5) it was so good! I used thinly sliced chicken breast instead and did 30 minutes at 375. Will be making again very soon. Glad you hear you liked it (it’s especially good when your whole family likes it). Oops. I can’t believe I did that. I made some changes earlier today to the recipe and I must have accidentally deleted the whole recipe. Luckily, I had a back up, so now it’s back up. Thanks for letting me know about it so quickly! Thanks so much for this delicious recipe, my family absolutely loves it. I experimented a bit with it last night, and the Instant Pot crowd will be happy to know that 10 minutes pressure cook on the poultry setting with instant release does the trick after you brown the chicken and sauté the onions and spices as directed. Then cook for another 5-10 minutes on sauté with the lid off to reduce the sauce, if you like. Thanks again! What an awesome tip. Thanks so much! I was looking at the reviews to see if anyone converted this to an instant pot. This is one of my favorite recipes. Thank you for sharing! Thought it would be weird with coconut milk. It wasn’t. It was tender and juicy and wonderful comfort food!! Made according to directions and well, it was all gone…. This was absolutely delicious! My fiance and I LOVED IT! Followed the recipe to a T and it was perfection. We will definitely make again. This was delicious I left skin on and broiled it at the end to crisp it up! This was incredible! I used a cut-up whole chicken and browned them in two separate pans to save time. my cook time was only 30 min at 400, but I’m guessing it’s because I browned them for a decent amount of time. thanks for sharing! I love this recipe. I have made it twice and again today but decided to kick it up by adding bulk hot sausage and celery to the onions. The house smells wonderful. I follow the Whole30 and need to have work lunches prepared on Sunday. Thank you so much. This is so good! Everyone in my family loved it and we’ve made it several times. I’ve tried a few recipes on your site and we haven’t been disappointed yet. LOVE, LOVE, LOVE this recipe! It’s one of my favorites! Thank you for sharing. I had this at a friend’s and it was wonderful! Do you know if this can be made the night before then reheated in oven before serving? This is so amazing! My husband and i started paleo and this was fantastic!! It is now one of my favorite things to make. It does seems to have quite a bit of sauce so when the kiddos are here i make some pasta and put the chicken amd sauce over it. Soo delicious!! Thank you do this. It is in the oven right now and cant wait!! I’m so glad you like it. It’s amazing how a few simple ingredients can really pull together to make something so good. Has anybody tried baking this, then freezing it to reheat later on? Any thoughts on if that would be successful? What does it mean “one T of oil, one T of garlic” etc… I don’t understand it, I’m sorry if it’s a stupid question. A capital T means Tbl, or Tablespoon. This was fantastic!!! My husband and I have 5 days left on the Whole30 and really want just a bit of southern comfort food! LOL. I made this just as written but used boneless, skinless chicken breasts (in a 9×13 dish covered tightly with aluminum foil). It totally hit the spot with steamed, fresh green beans and mashed potatoes (made with ghee and almond milk). The gravy was “fine” with the mashed potatoes. ? I feel almost guilty for eating such a comforting meal! Thank you so much for sharing. I’m so glad you liked it! Love the suggestions too. Kinda sort of. It’s not quite the same and doesn’t get the golden, roasted flavor. But people say they still like it. This was beyond amazing! It felt like a cheat meal on Whole30, but it was totally compliant. I used boneless skinless chicken thighs and just cut down the baking at 400 degrees by 5 minutes. I kept everything else the same. My whole family loved it. Next time I’ll try it over a baked potato or mashed potatoes. Thanks for the amazing recipe. It will be made many more times. I might even add mushrooms next time. Thanks for the nice comment and yes, mushrooms are really good in it too! Can I use this recipe to cook a while chicken? Looks absolutely amazing! I don’t see why not. I would just cut it up first so the chicken cooks in the juices, etc. and so it’s easier to serve and cooks faster. What is the equivalent weight of 8 chicken thighs if I want to use boneless chicken breasts? 1 LB, 2LB? Totally variable, but I would say about 2 pounds. if you use boneless chicken breasts, you will need to cut down on the time to cook — breast meat cooks much faster than thigh meat, then you have the added factor of the bone which also slows down the cooking time. i’m not sure how long you would need to cook them, but check them frequently or you could end up with chicken jerky…. making this tonight — please, please,please modify your recipe to say at the beginning of the recipe to preheat the oven to 400. I just got to that part and am groaning because now i have a 20 – 30 minute wait for my oven to heat before i can finish it. everything looks an smells amazing, but i am really frustrated because i didn’t know to heat the oven. Thanks for comment. I can’t believe I forgot to put that in the recipe. Duh! It’s on there now. Get outta here! This was delish! I did a mixture of thighs and breasts. Followed the recipe exactly as stated. The meat was so tender. My husband couldn’t believe chicken breast could be so tender and moist. Good to hear! Thanks for sharing. Hi, this looks delicious so I was excited to make it. I’m sorry to say we didn’t like it very much – there was a bitter flavor and the cream sauce was more like brown gravy for some reason, but we did do two things differently than your recipe. I used a casserole dish (I don’t have a Dutch oven) and I subbed oat fiber for the starch. I’m not familiar with the starch so maybe that was my mistake. I’ve used oat fiber as light “breading” before and it’s been fine, so I am just curious if that could have been the culprit. The chicken was very tender though! Thank you anyway for sharing! I’ve never used oat fiber myself, but search on Google for “oat fiber bitter” and there are lots of results, so that could be it. Maybe it reacted with the acidity from the dish and accentuated the bitterness? I made this for dinner yesterday and it was a crowd pleaser (the crowd being my husband and myself)!! After the oven my sauce turned into more of a gravy but it was delicious. I added a carton of sliced mushrooms because they needed to be used and we really enjoyed them in the dish! Thank you for this recipe! It will definitely make an appearance in our home again very soon!!! So good to hear! I’m glad it turned out for you. Think looks delicious, and I can’t wait to try it! Do you think it’d cook ok in a casserole dish? I don’t have an oven frying pan or Dutch oven. Thanks for the tips! Yep. I’m in love with my Le Creuset. Have you ever tried coconut milk? I detest coconut, but I love coconut milk. If not, any dairy will do, such as regular cream or probably even almond milk. Please let me know if you try alternatives so other readers will know what works. I have never tried coconut milk because anything with the word coconut in it makes me cringe. ? I use almond milk frequently. I can try that and let you know how it goes! Thanks! I don’t like coconut either- I avoid it at all costs, but I’ve had this dish, and others that use coconut milk, and I really liked it. You can’t taste any coconut flavor at all in this recipe. It is so good! Is there a difference in dry sun dried tomatoes or sun dried tomatoes in oil in this recipe? Yes. I definitely recommend you use dry sun dried tomatoes, or do your best to dry off ones in oil with something like a paper towel. Does this come out the same if you do it in a crock pot? I usually never leave reviews but this was too good not to! My hubby who despises coconut devoured it, literally licking his plate clean! I added a few portobellos to it for extra flavor but other than that followed the recipe to the T and it turned out wonderful! I served it over some mashed cauliflower. Cannot wait to make it again! Thanks so much for the recipe! That sounds really good. I love portobellos and mashed cauliflower. I especially like mashed cauliflower with coconut milk sauce and/or butter. This was so delicious! So flavorful! I served it with yellow jasmine rice and my family devoured it. I too did use sun dried packed in oil and used a bit of the oil to brown the chicken. Love this recipe, thank you for sharing!! Have been looking forward to making this all week! I have to say it was a huge disappointment. I thought the flavor was lacking, especially in the sun-fried tomatoes as they and the chicken had a stewed quality. Did you use dry sun-dried tomatoes and follow the recipe exactly? This turned out wonderful! I did use tomatoes packed in oil but I dried them a bit with paper towels. Thanks for the tip and I’m glad it turned out! This is the glorious high protein, lower carb recipe I have been looking for. I used chicken breasts and it pulls apart in the must luscious way. Will be making this recipe forever. Thank you!!!!! I’m so glad you liked it! Thanks for commenting. Just made this for dinner andy fiance and I are in love! I used heavy cream instead of coconut milk because I had some about to expire, and it was amazing! I look forward to trying coconut milk next time to make it dairy free. I didn’t have an oven safe stovetop dish so after browning the chicken I placed them in a 9×13 and then pour the sauce over it. Top with tin foil for the cover and it turned out perfect! Thanks for the tips. I’m sure other people will be glad to know all the options that work. I made this recently as part of my Whole30 diet and it was by far one of the best dishes I have ever had! The chicken is super tender and despite the simple ingredients, the whole dish is very flavorful! This recipe is definitely going to be one of my go-to meals, even beyond the Whole30. I’m so glad! Just goes to show that eating healthy can be very delicious. . .
i’m making this tomorrow but all i could find was sun dried tomatoes in oil. Will this work? I’m not sure because I haven’t tried it myself, but I’ll post your comment to see if others have tried it and they can let you know. Do I have to put it in the oven? I’m not sure I have a oven-safe dish with a lid… I’m wondering if I’m just using boneless chicken instead of bone-in if I can just skip the oven part. Would it still taste good if I just let is cook in low for a little longer? If you read some of the comments, some people have had pretty good luck cooking it on the stove top and using boneless chicken. It’s not quite the same, but still good. Thanks for the recipe. I’m doing Whole30 but, this will be a new favorite whether I’m doing Whole30 or not. It’s so creamy, I had no idea what to expect because, I’ve never used coconut milk. I’m so glad you like it. It’s definitely a popular recipe. I was scared to try coconut milk too, but once I did, there was no going back. Oops. Guess I should have kept reading the comments and then I would have seen this one. Thanks for coming back to give your feedback! I have bone-in chicken breast. (They were on sale!). Will those work? Also, can I use cherry tomatoes instead of sun-dried do you think? People have reported good luck with chicken breast. Just be careful not to over cook them. You could try cherry tomatoes. It definitely won’t taste the same and wont’ be the same consistency, but it will probably still be good. Please let me know if you try, so other people know if it turns out. Mine didn’t come out creamy at all. I followed the recipes exactly. Wonder what i did wrong. This is delicious, despite not having the oven to cook it in (I was in the process of scrubbing it) and today was the day I had no onions (I always have onions!). The stovetop worked well with chicken breasts. Being on GAPS, I can’t have thickeners/starch, so I used half the amount of broth and coconut milk, saving the other half of the coconut milk for coffee creamer sweetened with dates. I added mushrooms, zucchini, red and green peppers and the taste is amazing. This is my first time cooking with sun dried tomatoes. Thanks for sharing this recipe! Thanks for your feedback. Your idea sounds delicious and it will hopefully give other people ideas of how to change up the recipe. Shoftworker here looking for more recipes. Looks good, anyone try this recipe in a slowcooker? This was amazing! Used arrowroot starch instead of potato/tapioca/cornstarch. Also only used the 2 Tablespoons of oil to brown the chicken. There was enough left afterward to cook the onions, etc. Everyone cleaned their plates – including my 11 month old! So good to hear. I’m so happy everyone liked it and hopefully your comment will help someone else. I was thinking of using arrowroot starch also. Thank you for posting. Now I know it will come out just as good using that. how much arrowroot did you use? Could you use this sauce recipe for pasta?? We usually use pasta and/or bread to sop up this sauce, so I would think it would be a great sauce. I bet it would be awesome served over spaghetti squash?A true Paleo recipe!! I can’t wait to try this!! Thank you so much. My husband and I just started cooking/eating Paleo. I made this last night for dinner and it was so deliciously amazing, we both loved it! I used boneless thighs but cooked exactly as the recipe states. The chicken was falling apart it was so tender! I made “riced” cauliflower to go with the chicken and it worked well. If I can find more recipes like this, Paleo is going to be a breeze 🙂 Thanks so much! I’m so glad you like it! I just love the deep flavor from the sun-dried tomatoes and it really is good enough that people on any diet shouldn’t hesitate to try it! I made this using thighs as well as breasts, added mushrooms. It was fabulous! Cooked it exactly as in the instructions, and it came out perfectly. Thanks for the tips! Mushrooms sound divine. I don’t know what happened with my dish, but it did not turn out like the pictures….and I followed all of the steps! First off, it’s way too salty. Am I misreading that the starch mix calls for a tablespoon of salt?? Second, the sun dried tomatoes look way too cooked after being the oven for 45 mins. And lastly, after taking it out of the over, there is 0 liquid left in the pot. Any ideas? Did you use canned coconut milk? I’ve only tried the kind I link to in the recipe so maybe other brands are different? Did you cover the pan? Having your liquid dry out would explain the sun dried tomatoes cooking too much. When I use my dutch oven, i always cover it with foilbefore placing the lid on. Otherwise most of the liquid evaporates. The foil provides a seal to prevent that. Just had to come by and tell you this is an excellent recipe!! I’m in the middle of a whole30 and I’m so glad to have this one in the rotation now. I also must say that after 5 years eating paleo that I’ve conquered my fear of coconut milk in a savory dish and I could not taste one bit of coconut in it. So glad I read the comments otherwise I might not have made it, haha. I think my husbands constant “mmmm” while eating the dish is also a testament to how delicious this was. Thank you so much for creating and sharing with us! So good to hear! Yes. I too was very afraid of coconut milk in savory dishes, but now I love it. I especially love coconut milk in Indian dishes, like the Korma on my blog. I make Hawaiian haystacks and beef stroganoff with coconut milk too, but they taste a little funny. Not sweet or coconut-y, but you definitely miss the creamy texture from real milk in those dishes. This looks great! I have skinless, boneless chicken thighs. Have you ever tried this recipe with boneless thighs? I haven’t, but other readers have tried it and said it’s good. It won’t have quite as much flavor, but will be easier to eat and will take a few minutes less to cook. I want to make this dish but I want to use boneless skinless chicken thighs. Do you know if there would be a cooking difference? You may want to cook it for a little less time, like 5-10 minutes. I made this dish twice, the first time it was a bit under cooked, even though I followed the directions, the second time, I cooked it at 400 for 65 minutes and it was delicious. Thanks for the comment and the tips. I’m sure they will help others. First – this was an amazing recipe and it was guilt -free to boot. Thank you Rebecca. This was an awesome dish! I will most certainly make it again. I would recommend adding a splash of lime juice for an acid component. It really brightens all the flavors and also a few dashes of salt. Overall great dish super yummy! Thanks for the suggestions and I’m glad you liked it. Would arrowroot starch work in place of potato or tapioca starch? It should, but I haven’t tried it. Please let me know if you try it and it works. This is quite good!! When my husband asked me what was in it, I did not mention the coconut milk, because I thought he would object. Instead, he raved about how good it was and really liked it! I did too. For any reader who is concerned, as I was, about the coconut milk…. there is zero coconut taste. It’s just creamy, delishious, with a lot of flavor. I added a little more pepper because we like heat… Extra basil… And mushrooms just for grins. My changes were really nothing… Just our taste. This recipe is excellent. Great job Rebecca. Thank you. Thanks for the comments. I’m sure they will help other people – and I’m glad you liked it. How do you dry your tomatoes outside? And how would you keep flies and other bugs awayou while they’re drying? Any particular type of tomato you like better for this recipe? FANTASTIC!!! I was a little worried when I realized (as I was cooking) that the only sun dried tomatoes I had on hand were the ones in olive oil, so I strained them the best I could and cut back a little on the olive oil used in the rest of the recipe. Could not believe how wonderfully this came together! The flavor is amazing! Everyone loved it – 4 year old included! Hubby even requested left overs for tomorrow. Amazing there is any left over! Thank you! So good to hear. I’m glad it turned out for you! Easy and Delicious! Will definitely make a reappearance at this house. Good to hear! Thanks for taking the time to come back and comment. Thanks for coming back to comment. I’m glad you liked it. I really want to make this today, I’m just wondering will the leftovers freeze ok? Sorry, but I rarely freeze anything and don’t know how the leftovers will freeze. FYI to those asking about freezing, Ive found that coconut milk freezes quite beautifully which is critical for this busy single girl. I plan to make this tonight and will be freezing the leftovers to have throughout the month. I am not a fan of coconut milk could I substitute for something else? I would think any type of milk should work. If you try it, I would love for you to come back and comment to help others with similar questions. My daughter, 7, hates coconut and typically detects it a mile away. After she dug deeply into her plate of this dish, she asked what made it so creamy. I told her, and it didn’t bother her one bit. She loved it! I, personally, thought I tasted it slightly, but I’d go with Victoria’s palate on this 🙂 New family favorite (with added sliced red bell pepper — added with the onion). Good to hear and I I’m sure your modifications will be helpful to others. You could try, but you won’t get the same oven roasted flavor, but I suspect it would still be good. Please let me know if you try it. I used the slowcooker today, 5 hours on low, and I would agree it wasn’t as flavorsome as it could’ve been. Maybe needed to leave it in longer or cook it on high. Will need try the oven roasted version next time! It may help to cook it longer, because usually cooking something on low in the crock pot you would want at least 6 hours. But really you just don’t get the good roasted flavor in a crock pot so it’s just not the same for something like this. I wonder if broiling it for a few minutes once it’s done would help? Maybe crazy, but could be worth a try . . . I made this tonight, and it was super salty. The Sunday-dries tomatoes I purchased (dry) were exceptionally salty on their own. Otherwise, I think it would have been amazing. My recommendation- omit the salt, or at least half the amount. Hi I’m new to to wheat / gluten intolerance, and love cooking for my family. Cooking this dish tonight and wondering what it’s best served with. I think it’s good with rice and veggies. Potatoes could work too. Something to sop all all that good sauce. I can’t seem to find potato or tapioca starch anywhere. Do you think almond meal or quinoa flour would work? You can buy potato or tapioca starch on Amazon. There are links on the recipe. You really just need some sort of thickener, like corn starch or flour of your choice. Quinoa flour should work. It won’t be quite the same, but pretty close. You also don’t HAVE to thickened it. it will just be thinner and more like a soup instead of more like a stew. I’m pretty sure almond meal won’t thicken anything. Hi Rebecca. I made this a few weeks ago and oh man was it delicious!!! I’m just wondering how you would convert it to a slow cooker recipe? Hello! I would love to try this but my husband despises all things coconut. Does this have a distinct coconut flavor? Can I replace the coconut milk with regular milk perhaps? I don’t think it has a distinct coconut flavor. I was scared for a long time to use coconut milk for savory dishes and you really can’t tell much of a difference in most recipes. Yes, it can easily be substituted with regular milk. How much coconut milk are you using? I do not live in the US and our packaging sizes are different here. Thanks! We use 13.5 oz can. Sorry about that I will update the recipe. I want to try this tomorrow night. I have some red bell peppers I want to use. Do you think it would taste okay to add them? Maybe even roast them first? sounds like it would be fine to me! If you give it a try let us know how it worked out! I’m making this now and just realized I don’t have an oven safe lid bigh enough to fit on top of the cast iron skillet I used! Will this effect the outcome? Sorry we obviously soon enough. Did it turn out alright for you even though you didn’t have the lid on it? Curious to know how it turned out too?I have just put mine in a baking dish cause I don’t have a oven safe pan or lid. Should I cover with tin foil? I hope it turns out. It sound delicious!! Is this recipe dairy/gluten free? I am gluten and dairy intolerant. The recipe looks wonderful! Is tapioca starch also dairy/gluten free? I have seen it in many recipes. I am new to this way of eating. When using boneless, skinless chicken breasts, how souls you adjust the cooking temp and time? same temperature, I would think it would cook faster so just check it periodically until it is cooked all the way. My guess is around 10 minutes faster than the original but it might take just as long. Hey Rebecca, I’ve just read your chicken recipe and it looks and sounds very good! But I want to ask you,since I don’t live in the US and I’m not familiar with all your representations of quantities,what C means in the ingredient list? The capital letter T I assume is tablespoon, and the small letter t is teaspoon. Is it right? Well, the capital C I can’t figure out. Thanks for information about that. Yes, thank you Rebecca. A little later I figured it out. This meal is delicious. Thanks. I rarely leave comments, but I just had to do so after making this…. It is, by far, one of the best chicken dishes I have made in a long time!! I will definitely be making this again!! Yay! I am glad you like the recipe and thanks for the kind comment. Enjoy. We love this one too, so good! Did you cook it the same amount of time or less with the chicken breast? Chicken breasts without the bone don’t take as long to cook. I would say around 10-15 minutes less. I was going to ask if it would work with breast, glad to hear it will! Very good… Have made it 3 times already and making it again tonite for dinner… This is becoming a go to recipe in my house!!! Thanks for sharing it! I have never commented on any reciepe before, but this was excellent! My husband loved it. Will be making a double batch on Sunday to get us through the beginning of next week! Good hear! And thanks for commenting. This was seriously awesome! I was so nervous my husband and kids would be turned off by the coconut milk, but they loved it! I didn’t pay attention when I grabbed my sun dried tomatoes, and grabbed some with zesty peppers. It was awesome! Thanks for such an awesome recipe that really broke up the traditional tastes of dinner. You’re welcome – and thanks for taking the time to comment. This was really quick and easy and delicious! My house smelled heavenly as it was cooking. My husband (who hates chicken thighs) asked me to keep this to make it again! Glad it worked well for your family! Yes you can, you would simmer it for 45-60 minutes with occasionally stirring and scooping the sauce on the chicken. Make sure to not turn the heat up too high or it will just burn to the pan. This looks ABSOLUTELY fantastic and right up my alley! A MUST PIN for me!! Do most of your entree recipes have tomatoes, peppers, potatoes, or eggplant, or spices like red pepper? I eat Paleo but recently discovered I feel much better when I don’t eat nightshades. It’s very difficult to find recipes that don’t have these things, and even harder to find restaurants that don’t use them. 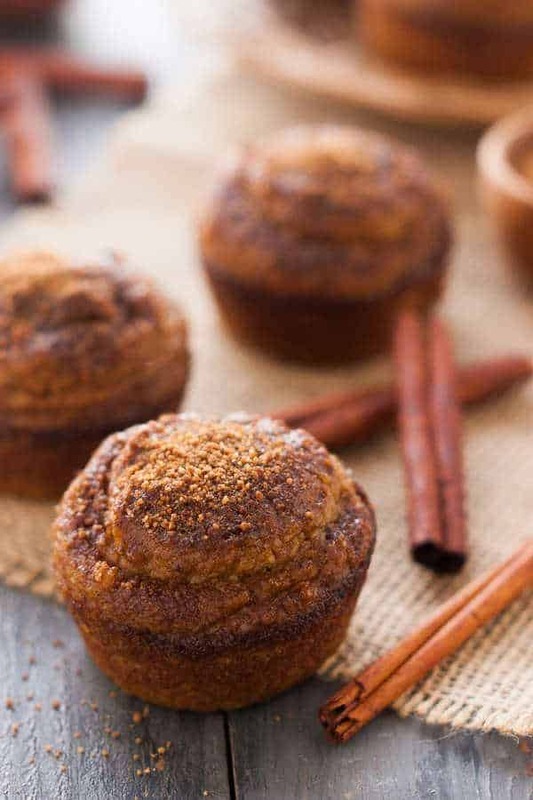 Here is the link to our list of our paleo recipes if you want to look through them feel free. You can decide if they work well for you. Would you adjust the cooking time if using boneless thighs? I feel as if 45 minutes at 400 might be too much. Making this and was wondering if you thought quinoa would be good to serve this over? Rebecca, this was the most delicious recipe ever! The chicken moist and tender, the sauce divine and easy to make! Thank you for helping this lactose intoleant person be able to eat something so creamy and delicious! I did serve it over quinoa and it was fantastic! Loved, loved, loved this recipe and will be telling everyone about it! Is there another way to cook the chicken if you do not have an oven safe fry pan or dutch oven? Yes. You just need one frying pan and then transfer it to an oven-safe dish, like a baking dish. It’s just a little more work and more dishes but it will work fine. Would you cover it with foil since there is no cover for the baking dish? sounds like that could work alright if you don’t have a lid. It needs to be covered. Thanks for your comments. I’m sure they will help other people. This recipe looks delicious! Yum! It’s 11pm and you’ve got me craving a big serving of your clean eating chicken. This looks insanely delicious… and like it’s going to be dinner tomorrow night! Chicken thighs is a favorite in our house and I need new ways to cook it. I love how easy this sounds and this looks like something my family will love!